Senator Ovie Omo-Agege, representing Delta Central Senatorial District . 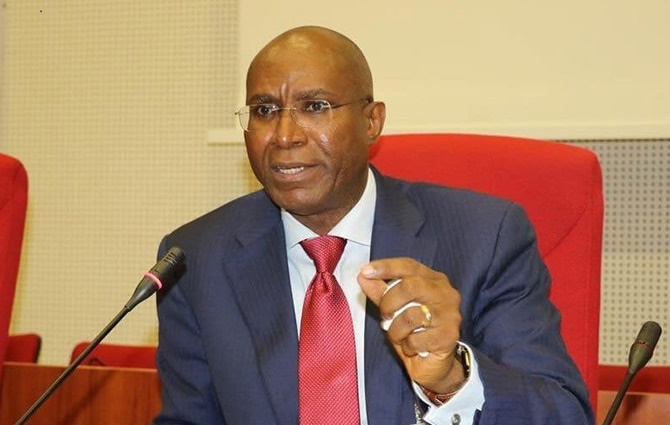 A Federal High Court has nullified the candidacy of the Delta Central senator, Ovie Omo-Agege. The court sacked the Jones Erue-led executive committee of the All Progressive Congress (APC) in Delta State, which Omo-Agege belonged. Justice Toyin Adegoke upheld the Cyril Ogodo-led Delta APC faction in the state, declaring the executives as duly elected. Adegoke further held that all actions purportedly taken by the Erue-led executives were null and void, thereby nullifying the candidacy of the candidates who emerged from the primaries. The counsel to the Cyril Ogodo excos in the suit, said, the reelection of the Delta Central senator and other candidates that emerged victorious in the just concluded polls is now null and void as they were produced from the faction primaries conducted by the Jones Erue excos. The court verdict also affected the gubernatorial candidate of the party, Great Ovedje Ogboru and former governor, Emmanuel Uduaghan the senatorial candidate for Delta South among others. “The primaries conducted by Mefor Progress, those names are the authentic names,” Ekpe said. The counsel to the Jones Erue excos, however, has urged the supporters of the faction to remain calm as they are going to look into the matter. “We will look at the judgment, and see what we are going to do, but hopefully we are going to appeal against the judgment. I am very certain that the appeal will be favourable,” Nwachukwu stressed.